This church contains an interesting effigy which is discussed first. Then follows the church architecture. Lady, early C14; only the bust appears in a recess, the rest of the slab is left flat and unworked. It is quite possible that the effigy represents a lady of the manor. In the hope of finding a likely candidate, I obtained a list of medieval Lords of the Manor from the Hampshire Vol. 2 of the Victoria County History. Dates in parenthesis relate to their mention in medieval records (identified in the VCH). Margery de Venuz, survived her husband and continued in possession. Must have died 1325-27 since her son below inherited and died 1327. 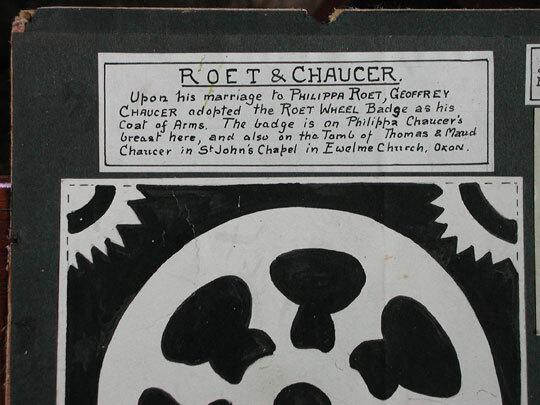 Thomas Chaucer and Maud Chaucer, daughter of John de Burghersh. (They are mentioned in possession in 1418). Thomas died 1435, Maud 1437. The effigy was discovered under the floor of the church in Victorian times and then placed in a recess in the south wall of the nave, without any identification as far as we know. Could the effigy be that of Margery de Venuz in the list above? 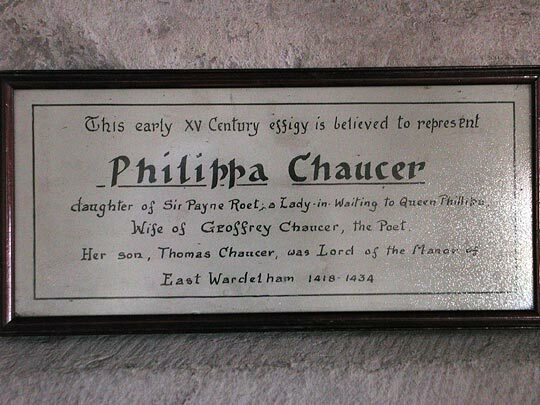 She is the only female of the 13th and 14th centuries mentioned prominently in the VCH for the manor of East Worldham. The date fits. She died in 1325-7 and whilst the style of dress indicates a date in the second decade of the 14th century at the latest (see authority below), effigies could be commissioned while the subject was still alive. The VCH mentions some family drama. 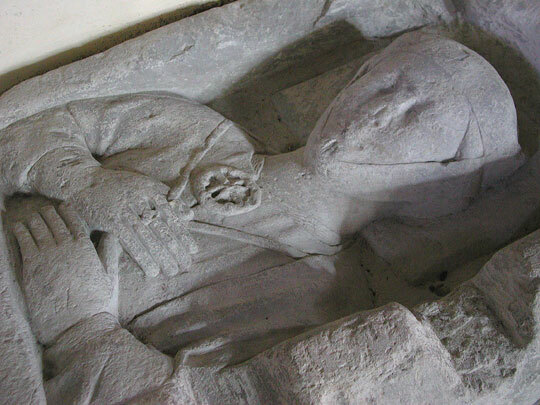 When John de Venuz died in 1325, his wife Margery continued in possession, but then her son had her ejected. She managed to reseize the manor, but then she must have died soon after because her son did inherit upon her death, and he himself died in 1327. 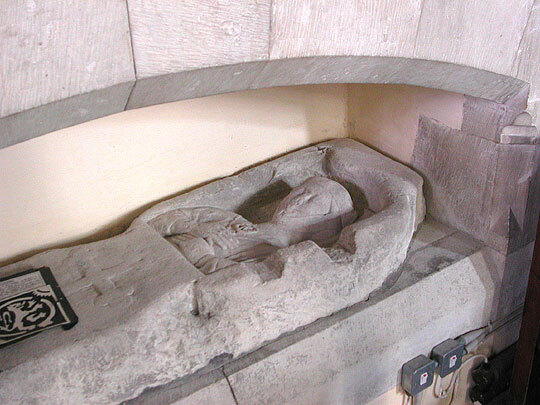 If the effigy represents Margery, did the son have it installed in the church upon her death, and was it then tucked away under the floor shortly afterwards when the Venuz family lost possession after a protracted legal dispute and the new owners did not want any suggestion that the old family still had a claim? Note that unless further evidence appears this is just speculation. It could be another female member in the generations of lords of the manor. Or somebody else entirely. Dating by costume: Helen Persson (Assistant Curator, Furniture, Textiles and Fashion, Victoria and Albert Museum) dates the effigy, based on headdress and dress, to late 13th century or early 14th century, but absolutely no later than the second decade of the 14th century. The matter was investigated in 1969-70 by Professor Nevill Coghill, the distinguished Chaucerian. He corresponded with many experts and the correspondence was deposited at the Hampshire Record Office (Accession No. 52M70). The conclusion then was the same as above, i.e. 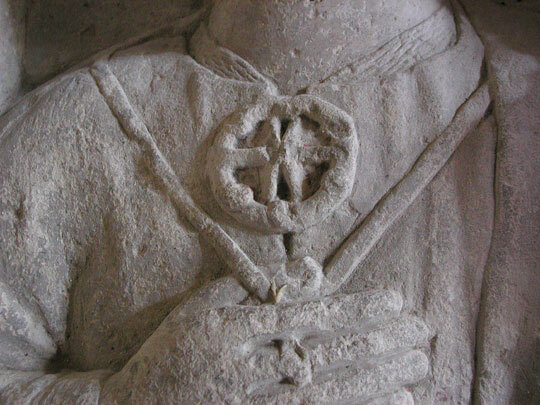 that the "badge" was a brooch, and that the effigy dated from early 14th century at the latest. One of his expert sources, Mr John Harvey, also proposed Margery de Venuz as no.1 candidate for an alternative identification. Notes in italics are from Hampshire and the Isle of Wight by Nikolaus Pevsner and David Lloyd (1967) Yale University Press, New Haven and London. Early C13 all. Nave and chancel and formerly an apse. Lancet windows, internally with fine continuous roll mouldings. The W side has three widely spaced lancets, shafted inside and outside. The corresponding feature on the E side looks Victorian. David Brandon did much in 1865. 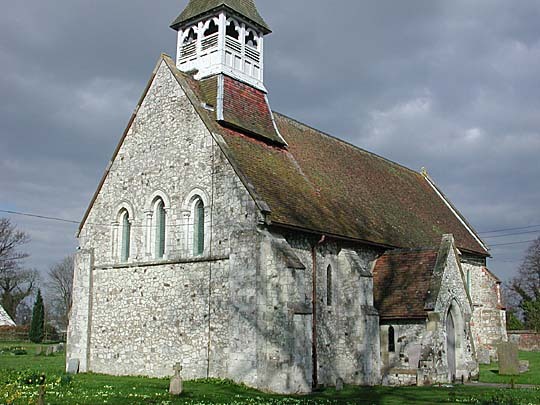 The Victoria County History says that "The nave was for the most part rebuilt in 1865, but with the old materials". 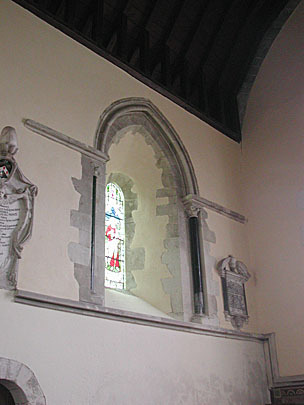 Almost identical S and N doorways of two orders of colonnettes with waterleaf capitals, pointed, richly moulded arches, and dogtooth in the hood-mould. The priest's doorway is contemporary too, though it has fully developed stiff-leaf capitals.